Three Janney Montgomery Scott LLC Financial Advisors were recognized by Forbes magazine through their America’s Top 500 Next Generation Wealth Advisors, 2017 Award. They were recognized for their success as Financial Advisors and for putting their clients’ needs at the center of all that they do. This prestigious, national recognition was given to Janney’s Ryan Hamilton, Jeremy Lambert, and Eric Park Walker. Forbes America’s Top 500 Next Generation Wealth Advisors, 2017 is powered by SHOOK Research, which created a ranking of top-notch millennials who are the next generation of advisors. Millennials were defined as those born in 1980 or after, who have built and now lead their own team, or who joined a team and are acting in an advisor role. This is the first time that Forbes released a ranking of millennial advisors. They received over 19,000 nominations for the award, which was narrowed down to more than 2,300 individuals who were considered. Ultimately, only 500 were chosen. 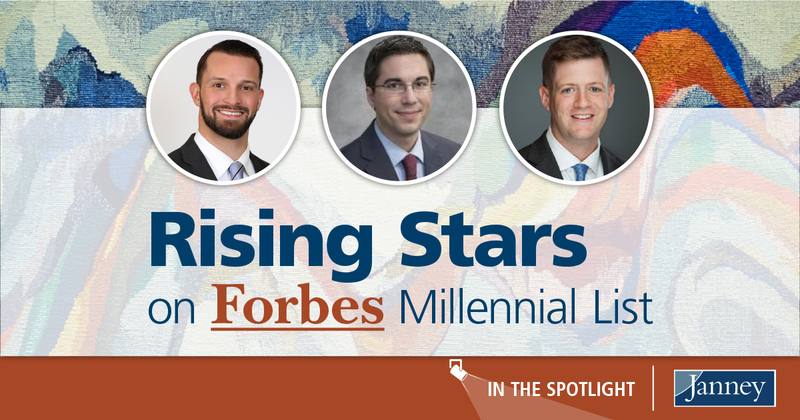 Read more about these rising stars at Janney below. Ryan understands the hard work that it takes to be successful in the financial services industry, and is used to giving his all. Before he became a Financial Advisor, he received a football scholarship to Vanderbilt, where he was captain and starter for the University’s football team. After college, he played for the Philadelphia Eagles in several pre-season games until he became injured and began his career in financial services. Jeremy was excited to receive the award, especially because the ranking looked beyond only financial measures and recognized individuals who go above and beyond for the clients they serve. This is his strong suit. Whether he’s collaborating with a client’s attorney and CPA to facilitate comprehensive estate planning, or educating a client about best financial practices of purchasing a new car – Jeremy prides himself on building relationships with his clients to help them take the necessary steps to work toward their financial goals. Eric Park Walker, CFP™, is a Financial Advisor for the Shaffer Wealth Advisory Group in Washington D.C. The group is one of Janney’s most successful teams, and Eric is grateful to have the opportunity to be a part of it. He joined the group in April, 2015. Two years later, he continues to focus on business development and growing his own book of business. On receiving the Forbes award, Eric said, “It’s nice to have good publicity and to be recognized. I hope that it leads to recognition for not only me, but of the team that I work with. I feel fortunate to be with Janney, and to be with a firm that has the foresight to create programs that recruit younger advisors.” Eric was recruited to Janney as part of the Rising Star Program, a transition program that recognizes successful, growth-oriented advisors who want to take their practice to the next level. “I have resources at Janney that I never had before. There’s a strong culture here and we work together,” he said. Eric stays active outside of work, and is focused on leading a healthy lifestyle and playing softball. He is also involved in the Special Olympics of D.C., where he helps plan the organization’s end of year gala, the non-profit’s largest annual fundraising event.